Though it is not easy, or in some cases possible, to do any outdoor grilling during the unforgiving winter temperatures, there are those who are unwilling to put aside the thoughts of a burger or steak cooked to perfection, with the marks to prove it. For those who can afford the $200 price tag, the Staub or Le Creuset grill pans are the best of their kind. Of course, not everyone can flaunt their grilling in such style. For the rest looking for an affordable option, here the 5 best indoor grill pans, all for less than $50. 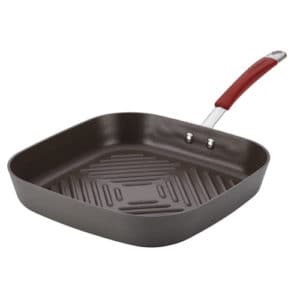 T his deep square pan offers 11 inches of hard-anodized aluminum for fast, even heating. 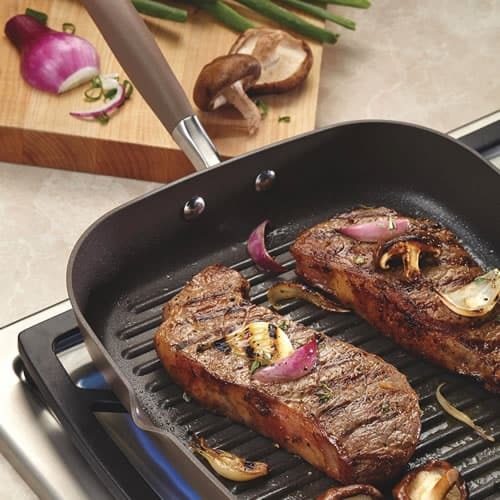 The ridges are dual-purpose, creating perfect grill marks on vegetables and meat, as well as keeping the dripping fat below the foods for healthier eating. It has Anolon’s Sure Grip rubberized handle for comfort, and is dual-riveted for added durability. There are 2 convenient pour spouts on the sides to drain unwanted liquids. It is oven safe up to 400 degrees Fahrenheit. Both the unique bronze exterior and the chocolate-colored interior are not only non-stick, but stylish enough to match any kitchen. This 11 inch hard-anodized aluminum grill pan is suitable for all types of stovetops, with the exception of induction. The handle is made of stainless steel, covered with cranberry red silicone, which offers protection against heat as well as a comfortable grasp. The bottom ridges produce quality grill marks while preventing the excess fat from touching the food. 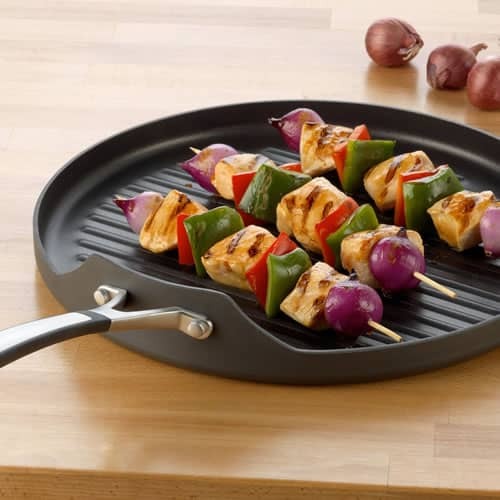 The non-stick surface means no struggling to remove food from the pan, and makes cleanup a snap. This pan is oven-safe up to 400 degrees Fahrenheit, and unlike most pans of this type, is dishwasher safe. 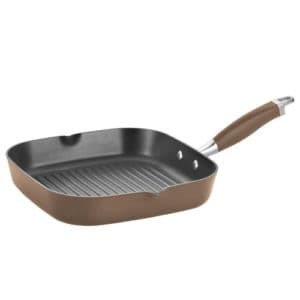 This pan is 10 inches of heavy-gauge aluminum. The non-stick coating has 3 layers for durability and the smooth release of even the most delicate of meals. The stainless steel handle is designed to remain cool when cooking. The even heating and deep ridges create high quality marks and browns perfectly while keeping the food above the excess fat. It is large enough to cook for a group, with easy clean-up. Both pans and covers are oven and dishwasher safe. This 10.5 inch cast-iron cookware is multi-functional, and can be used not only for stove-top and oven cooking, but outdoors on both grills and campfires as well. It is pre-seasoned for immediate use, cooks evenly, and has excellent heat retention. The ribbed bottom keeps food above the excess fat for healthier eating, and creates restaurant-quality grill marks on meats and veggies. This stylish black pan will suit any home chef’s kitchen, and because the cast-iron is practically indestructible, it will last for decades. This pan is 13 inches of hard-anodized aluminum, which retains the heat for even cooking. The non-stick interior is double-coated for easy food removal and cleanup. The ridges on this pan create authentic stripes on all foods, and keep it out of the excess drippings for a flavorful and healthy meal. It comes with a tempered glass lid. The handle has a silicone cover for comfort while still staying cool. It is oven-safe up to 400 degrees Fahrenheit. When using a grill pan, it is important never to coat it with oil when cooking. 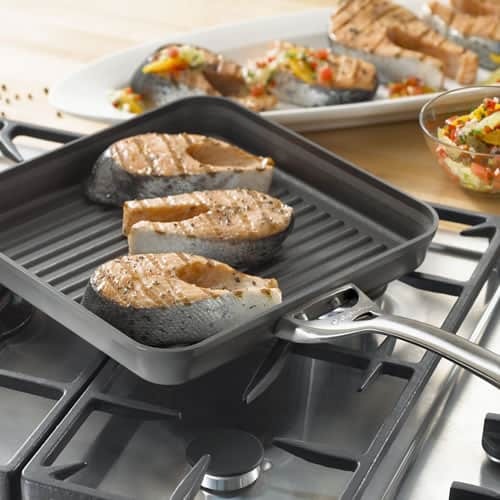 The non-stick surface has no need for it, and when preheating, the oil will burn and smoke. It is acceptable to brush oil over veggies before cooking, but most meats have their own natural oils that eliminate the need for oil. Preheat the pan until it is quite hot, and then reduce to about medium-low, which is the temperature that should be maintained throughout cooking. Place the food in the pan, and leave it alone for about 3 to 4 minutes. For crosshatched grill marks, rotate 90 degrees, and then cook for the same amount of time. When the time is up, flip it over and repeat the process on the other side. There may still be smoke, so be sure to turn on a fan or open a window early in the cooking process. It can also help to reduce the amount of smoke by putting the pan in the oven, thereby containing the smoke. If oven use is preferred, preheat to 500 degrees Fahrenheit with the empty pan inside for about 10 minutes, and then proceed as instructed above, being sure to turn the meat halfway through. It is important to only open the oven door when necessary to retain the heat. Though there are some pans that are dishwasher-safe, most are not meant to be cleaned with soap, or even be immersed in water. Simply wipe them clean with hot water when cooled, and only use a nylon brush for any hard to remove spots. Summer will not be here for a few months yet, but for a true grill-master, those tasty meals just won’t wait. Any of the pans above will make those summer cooking fantasies come true, with all the delicious flavor of the outdoors, from the warmth and comfort of the kitchen. I can’t believe that there are lots of great indoor grill pans under $50. several months ago, I bought one for around $75. I regret didn’t find your post early.